Setting up an office inside your house and want some home office design cues? Read on. Most people’s idea of a home office is to have a metal desk and a chair. But you are not most people – your design aesthetic runs more towards art than commerce, and you want your home office decoration to result in an eye-catching space that encourages work. And then there was light! The most important element that differentiates good home office design from a bad one, is the use of light. You will find that the more efficient the use of natural light in the home office decoration, the cosier and livelier the space becomes. Let’s face it – white light from an overhead tube is too impersonal and uninspiring. A large bay window, a skylight or even a port window – these are all excellent natural light sources. Be an office with a view. Another simple home office decorating idea to personalise your working space, is to give yourself a view. You would rather look out at moving traffic from your seat, than a blank wall, right? If you have a really great view, then you should place all working desks in a way that makes the most of it. A great view spurs productive thinking, and if you install a seat under the window, it becomes a good coffee drinking spot as well. Organise your space both horizontally and vertically. You may not have too much square footage at your disposal, so it pays to be economical and practical when you design storage space. 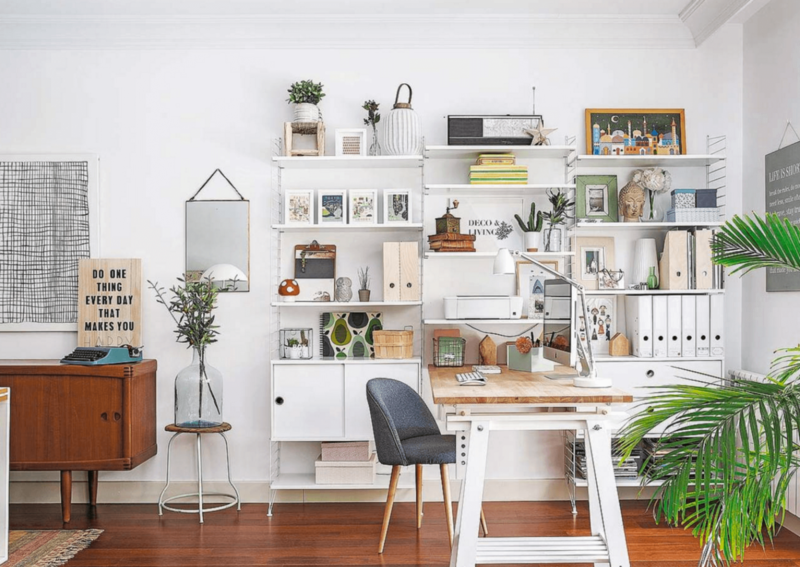 Go both horizontal and vertical when creating storage – apart from in-trays and filing cabinets on the floor, install a large floor-to-ceiling storage unit to hold files, office supplies and other inventory. You can paint the cabinet in a colour that contrasts with the rest of the furniture. Install floating shelves in different colours for added quirk. Accessorise at a mid-way point: it’s still inside a home, though it’s an office. Though your home office is a professional working space, it is still located inside your home. Thus, home office decoration cannot have a jarringly different design aesthetic than the rest of the house, or it will just look disjointed in the overall décor scheme. An easy way to offer visual continuity, is to pick accessories seen elsewhere in the house – the same coloured coffee mugs, the same doormats, or wall art that follows a similar theme to other paintings in the home, for example. Hide away wires and cords – keep only appliances in view. Your office will hum with activity – and computers and printers. Though you cannot beautify these electrical appliances, you can certainly hide away the cords and wires dangling from them. Get your electrician to safely ‘staple’ the wires and cords to the wall in a straight line, or have them concealed entirely. You can also scout for cute cord covers or wire organisers that hold the wires and reduce chances of tripping on the floor. How do you like these home office decorating ideas? We would love to hear a few of yours as well!